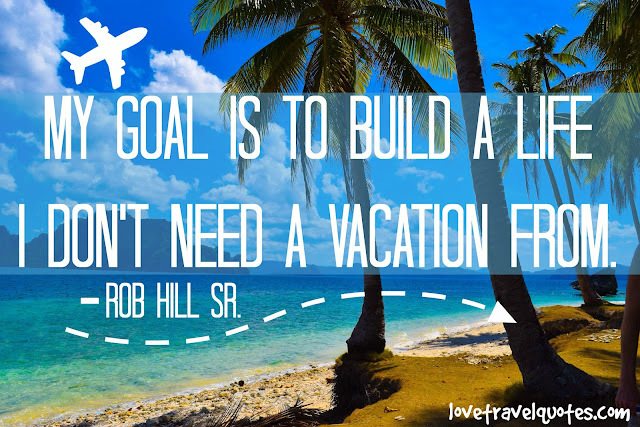 Rob Hill Sr is an American author, entrepreneur and public speaker. Hill's love of travel and writing no doubt comes from the fact that he spent a lot of time travelling between America, Europe and the Middle East. The great thing about this travel quote is that it seems so obvious, yet so many people don't live their lives like this. 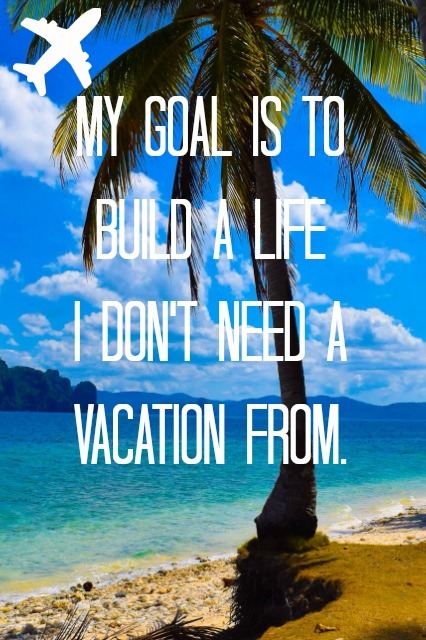 Surely everyone's goal should be to build a life that they don't need a vacation from? To wake up everyday happy in the knowledge that you are doing whatever it is you really want to do; that you are building a perfect future for yourself; that you are chasing your dreams, not someone else's. Harun Yahya, also known as Adnan Oktar is a Turkish author and Islamic creationist, i.e. he doesn't believe in evolution. He has been described as the 'most notorious cult leader in Turkey' - source - and has a following of plastic, blonde women known as 'the kittens'. Probably not the most inspirational man ever, but maybe it does take a mad man to write such a perfect quote. 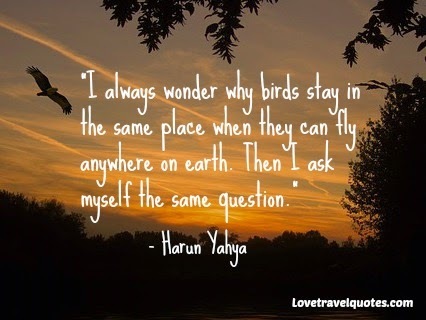 Like the first quote, this one seems pretty obvious: almost everyone on the planet has the means to fly anywhere on earth, sure you will probably have to save up for a while, and for some it will be a long while; but if it's something you've always wanted to do, why not? Robie Rogge is the co-author of the book Do One Thing Every Day That Scares You: A Journal. It's a whole year's worth of motivation in one neat book. 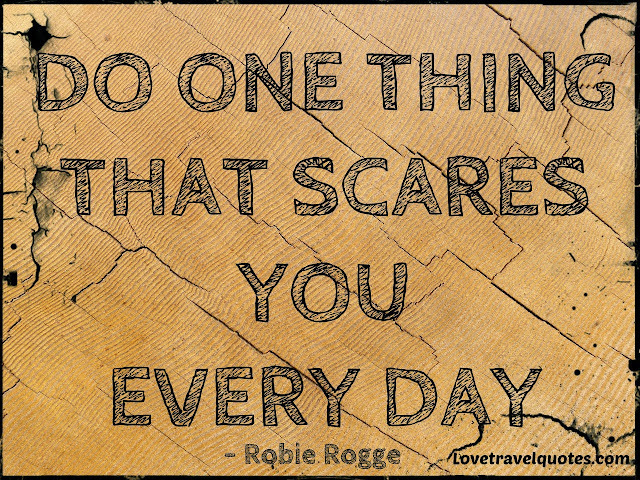 When was the last time you did something that scared you? Embrace the unknown! Doing something that scares you will hopefully make you motivated, inspired and prove to you that you can do anything. Why live a life of fear and doubt when you can live one of joy and ecstasy? If you're afraid of heights, go to the highest tower in your city, jump out of an aeroplane, go bungee jumping - whatever it takes to prove to yourself that it will be okay, you just need to take a leap of faith. Kevin Kelly is the founding executive editor of Wired magazine. Having travelled a substantial amount through Asia and the Middle East, he can definitely be seen as an authority on travel, so no wonder he came up with such an impressive travel quote. 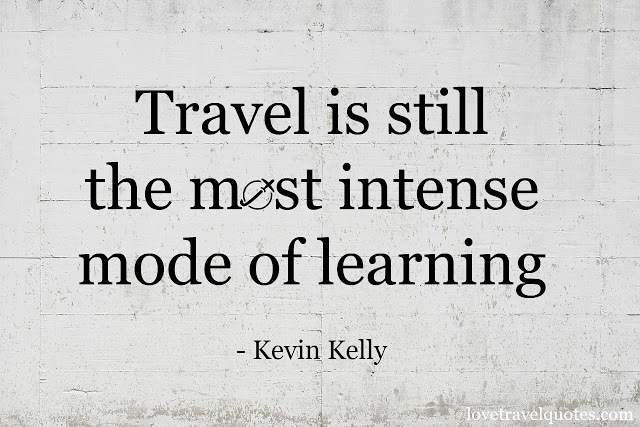 We all want to learn, what better way to do so than through travelling? One of the best parts of travelling is you don't necessarily know what you will learn - you might go to Africa to volunteer and learn how to teach children, but you might come away having learnt how to empathise and broaden your mind. You might go to Europe to learn how to work on a farm, but you might come back having learn how to cook. The possibilities are endless. Anais Nin was an essayist and memoirist. Nin was born to Cuban parents in France and grew up in Europe, New York and Cuba. Thus it is clear how she came up with such a perfect travel quote - she was a true traveller. There are so many great reasons to travel: to learn, to explore, to inspire yourself, to see that the world is a lovely place. Many people who go travelling find that they don't want to return, and if they do, they're not the same person that they once were. Being bitten by the travel bug is a life changing experience that everyone should have. 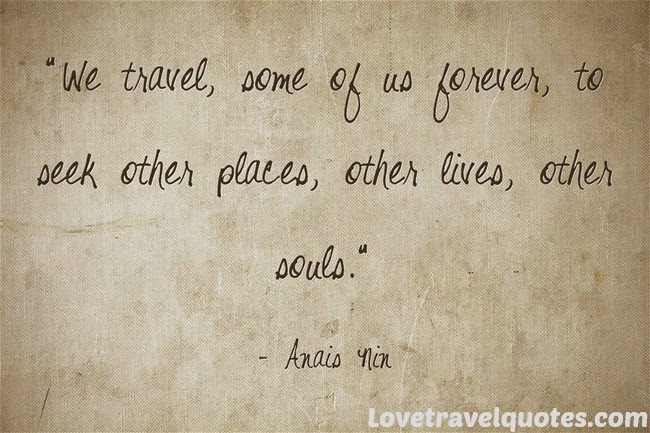 What's your favourite travel quote?